This scholarship was established in Dan’s memory to help Wyoming resident undergraduate or graduate mechanical engineering students complete their education. The rationale for establishing this scholarship is to give deserving students some extra financial help, such as Dan needed during his own collegiate career. Dan graduated from Marquette University in Milwaukee, Wisconsin, with a BS in mechanical engineering, after completing a five-year undergraduate program which included a mandatory co-op engineering experience. Kearney and Trecker Corporation, machine tool builders, chose Dan as one of their Cooperative Student Engineers during his junior and senior years. Funded by the National Commission on Industrial Hydraulics, Dan received a fellowship to complete an MS in mechanical and aerospace engineering at the Illinois Institute of Technology in Chicago, Illinois. Receiving one of only five fellowships awarded each year by the National Aeronautics and Space Administration (NASA) to doctoral-level engineering students, Dan completed all coursework for a PhD in mechanical engineering at Colorado State University in Ft. Collins, Colorado. As a project engineer for AC Electronics Division of General Motors Corporation, Dan lived and worked in Europe in order to participate in the development and analysis of the stabilization system for the U.S. Army Main Battle Tank MBT-70. Dan was employed for 29 years as an Engineering Staff and Consulting Engineer by the Woodward Governor Company, Industrial Control Division in Ft. Colllins. He was responsible for the development and analysis of hydromechanical, electromechanical, and digital control systems and their applications to various types of prime movers. He also was experienced as a consulting engineer on control system dynamics for electric power generation, marine propulsion, diesel-electric locomotive power, and locomotive wheel slip control. Later, Dan founded his own engineering consulting firm, DCG Power Systems Engineering, which served both domestic and international engineering client-firms, remaining in full operation until his untimely passing in September 2012. Dan obtained five patents, authored eight articles which were published in professional engineering journals, and received multiple technical awards, among them the SAE Arch T. Colwell Merit Award for an outstanding technical paper. His professional engineering memberships included ASME, IEEE, and SAE. Dan was also a member of Triangle, Pi Tau Sigma, and Tau Beta Pi. Dr. Donald F. Adams was a professor in the Department of Mechanical Engineering for 27 years, retiring in August 1999. In 1972 he founded the Composite Materials Research Group (CMRG) at the University of Wyoming, and then actively directed the Group until his retirement. Many M.S. and Ph.D students graduated from the CMRG program under his direction, and part-time employment and summer work was provided for an even greater number of undergraduate students. Th ese former graduate and undergraduate students are now leaders in industry, government and university programs throughout the United States. In 1988, Don and Roberta Adams founded Wyoming Test Fixtures, Inc., a Laramie company dedicated to supplying high quality mechanical test fi xtures to the materials testing community throughout the world. Dwight Senser, a native of Casper, received his B.S. and M.S. in the Department of Mechanical Engineering and a Ph.D. from Louisiana State University. Before returning to UW in 1994, he was on the faculty at Purdue University where he was recognized as an outstanding teacher and for his research in coating application technology. At UW he was a valuable member of the mechanical engineering teaching faculty and was nationally recognized for his research. He played a key role in recruiting and retention of students and was highly regarded by students, staff and his colleagues. His untimely death left an enormous void for his loving family and devoted friends. This scholarship was established with memorials from his family and friends. Dr. J. Steven Mayes Memorial Scholarship was established in 2010 by Firehole Composites (formally Firehole Technologies). 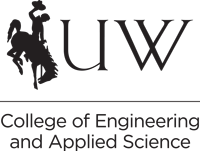 This scholarship will be awarded to a UW College of Engineering and Applied Science student majoring in mechanical engineering, who demonstrates an aptitude for composite materials. Dr. Steven Mayes will be remembered as a man who excelled in engineering and embraced a "relentless pursuit of a good life". A native of Casper, Wyoming, Ivan G. Heady graduated from UW in 1942, with a degree in mechanical engineering. During World War II he worked as an aeronautical engineer for Hughes Aircraft. Following the war he was employed by the Laramie Petroleum Research Center, U.S. Bureau of Mines, as a mechanical engineer. This endowed scholarship was established with a bequest from Mr. Heady. The scholarship is awarded to a sophomore, junior or senior student in mechanical engineering who is a resident of Wyoming. Jim and Audrey Bailey came to Wyoming with their families in the early 1900's as children and were married just before WWII. They spent most of their lives near Casper, raising four children, and they were successful ranchers and owners of the Bailey School Supply Company, one of the foremost suppliers to rural education in Wyoming for over 50 years. Committed to quality education for Wyoming's children, the Jim and Audrey Bailey Foundation supports a number of scholarship programs for students in the region. They have seen many family members and friends benefit from an education at UW, and this scholarship is intended to further that goal. Glen and Donna Larson funded the annual Larson Family Scholarship in Mechanical Engineering. Glen has served on the National Advisory Board for the CEAS College. As a 1970 Mechanical Engineering graduate, Glen flew and distinguished himself in the aeronautics industry. In order to encourage outstanding incoming freshmen to enter UW and to pursue a degree in mechanical engineering, the Department of Mechanical Engineering awards scholarships. Alumni and corporate gifts to the department provide funds for these scholarships. This scholarship was created in 1975 with money received from the James F. Lincoln Arc Welding Foundation's annual student design competition in recognition of the many awards won by students in Professor Robert Sutherland's mechanical engineering design classes. Professor Sutherland graduated from the University of Illinois and taught at the University of Iowa before coming to UW in 1958. In 1960 he became Department Head of Mechanical Engineering. He retired in 1979 and continued to remain actively involved in special projects for the ME department and wrote the History of the University of Wyoming College of Engineering 1883-1993. The ME department has honored his service, support and commitment by naming the Robert Sutherland Advanced Design Lab in his honor. Mrs. Sutherland continues to generously contribute to this scholarship endowment and to other special projects in the Department of Mechanical Engineering and the College of Engineering. Warren and Gary Siebold, brothers and graduates of the College of Engineering at UW endowed a comprehensive scholarship benefitting different majors at the CEAS College. Their scholarship will annually be awarded to undergraduate students in Petroleum Engineering and another student in Mechanical Engineering. They would also like to help a graduate student in Atmospheric Sciences and a student with a demonstrated financial need in the College of Engineering and Applied Sciences. ﻿Ralph W. Holland is remembered by his family and friends for many reasons, none more prominent than his entrepreneurial spirit and strong work ethic. In 1916, at the age of 19, Ralph boarded a train in Lebanon, Kansas, bound for UW. As a Mechanical Engineering student, Ralph began working at the Enterprise Cleaners, which he purchased two years later, to earn enough money to pay his way through school. During his lifetime, Ralph invented several cleaning machines, and the largest commercial laundry in the Rocky Mountain region. Elsie M. Holland established this endowed scholarship to honor the memory of her late husband.